February 19, 1918-- Frank Lloyd Wright Lectures: "Despair and Hope"
February 19, 1918 – Frank Lloyd Wright tells members of the Chicago Woman’s Aid at the Art Institute that he sees in Chicago “at once a despair and a great hope.” [Chicago Daily Tribune, February 20, 1918] “A Chicago smokestack has more vitality as of work of art than the effete gray ghosts of a dubious past which now haunt the lake front at the foot of Monroe Street,” the architect tells his audience. He continues, “Is anything uglier than dirt—unless it is noise? We have both. Some one defines dirt as ‘matter out of place.’ In this sense Chicago culture is just dirt—matter out of place in all its ugliness. 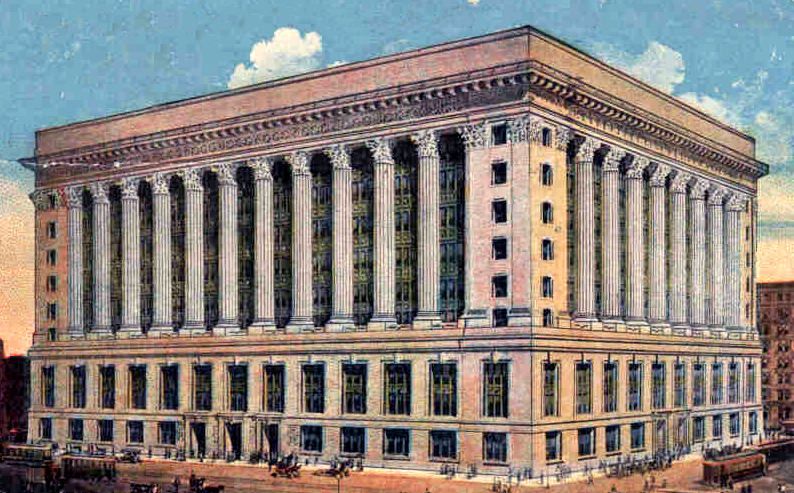 Chicago is Indian for onion—in name, as in reputation, unesthetic [sic].” Wright suggests a new city seal, according to the newspaper’s coverage, a “shield trifoliate—on onion, beautifully emblazoned on the shield; beside the onion, on the right, a pig, rampant; at the left, a poet, also rampant.” He blasts the building that houses City Hall, calling it a “big bluff in vain classic costing thousands a month for great columns that are a huge and expensive load to carry instead of carrying the load.” Demanding a new vision to replace the old Beaux Arts style he sees as so out of place in the middle of the Midwestern prairie, he says, “We are plundering the old world of all its finery and dressing ourselves up in it as a kind of masquerade. This is not culture in any real sense.” In his conclusion, Wright states, “Only revolt can save the city for the culture that is for all time. One thing Chicago must do; she must take her great heritage—the lake front – and shape it to her own liking.” The eight-year-old City Hall against which Wright railed is pictured above in a 1915 postcard. 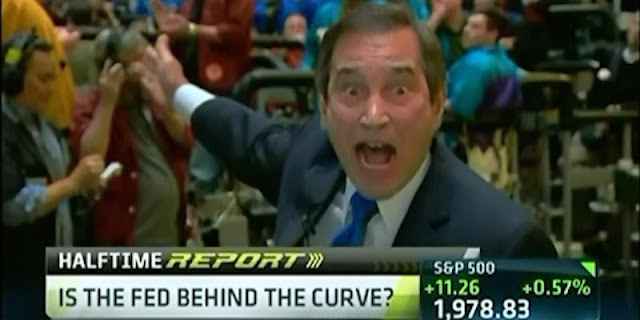 February 19, 2009 -- Full-out rant at the Board of Trade as CNBC commentator Rick Santelli rails against President Obama's mortgage bailout plan. "The government is promoting bad behavior," Santelli storms. "This is America! How many of you people want to pay for your neighbor's mortgage that has an extra bathroom and can't pay their bills?" Sanely follows up by suggesting that a modern Chicago tea party might consider dumping derivative securities into Lake Michigan. It was on this Thursday morning that a whole new era in American politics is born. Here's the segment, just for old time's sake . .